Bad breath, or halitosis in medical terminology, can be a big deal. It can be a turn off for the people around you and affect your confidence. You’d never want to go to a job interview or on a big date with a stinky mouth, so get that problem solved now. We often think of certain culprit foods like garlic and onions being the cause of such problems, but there are other controllable factors at work. The foods you eat are just one cause of bad breath. After digestion in the stomach, food is carried through your blood stream and odor-causing molecules eventually get to the lungs where they are released in your breath. If you frequently eat garlic, onions, asparagus, and other foods known to cause odor, consider scaling back on them in your diet. Some foods, although not inherently smelly, can also lead to bad breath. Foods high in citric acid like lemons, oranges, and pickles foster an acidic environment where bacteria can thrive. Drinks and mouthwashes containing alcohol can dry out your mouth, leading to increased mouth bacteria. 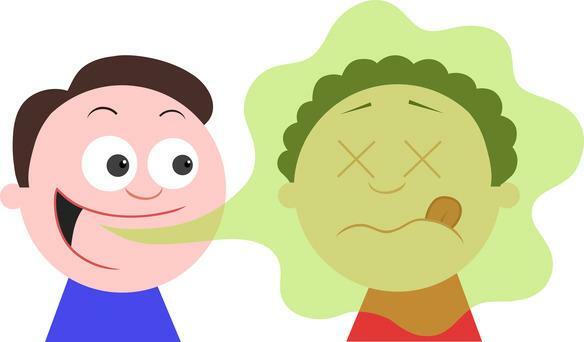 Excessive protein consumption leads to high amounts of ammonia and ketones in your body, which leads to bad breath. We’re not saying you need to rid your diet of these things, but moderation is important. Bacteria are another major source of bad mouth odors. Food particles not cleaned out properly, especially sugars and carbohydrates, promote bacterial growth. Thorough daily brushing and flossing can keep bacterial populations to a minimum and prevent bad odors from occurring. It is also important to realize that most of the bacteria responsible for bad breath live on the tongue. Consider using a tongue scraper or the concave side of a spoon to gently remove trapped bacteria from the tongue surface. Bad habits like smoking and chewing tobacco can also cause bad breath. These habits cause cellular changes which lead to cancer, which alone is enough reason to quit, but they also cause dry mouth and promote bacterial growth. Certain medical and dental conditions can also cause bad breath. Yeast infections, gum disease, dentures that don’t fit well, cavities, respiratory infections, sinus infections, diabetes, acid reflux, kidney disease, and liver disease are all associated with bad breath. If you have bad breath after improving hygiene, adjusting your diet, and eliminating tobacco use, it is a good idea to seek advice from your dentist or medical doctor.